RIO GRANDE CITY — Earlier this week, the Starr County commissioners agreed to maintain the property tax rate at the same level for the next fiscal year. However, the county plans to eliminate the interest and sinking tax which would result in a refund, albeit a small one, for taxpayers. The overall tax rate will remain at 0.7784 as approved by the county commissioners on Tuesday. However, the collected taxes will no longer go toward the interest and sinking fund, or I&S, which is used to pay certain debt. 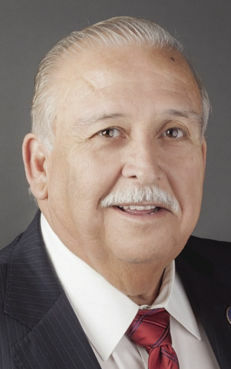 Up until this point, the I&S tax went toward paying off a bond issue in the 1980s or early 1990s, according to Starr County Judge Eloy Vera. “This year, my plans are that we would pay it off completely — we owe $1.55 million — we don’t need the I&S anymore,” Vera said. Once that bond issue is paid off, the county will have to return the surplus to the taxpayers. County Auditor Boyd Carter said on Wednesday his office was working on calculating just how much that surplus amounted to but Vera estimated that it was about $400,000. Carter’s office is also figuring out how to go about refunding the taxpayers but said that the refund to each property owner would likely be very small given that there were more than 77,000 parcels of land in the county. With the fiscal year nearing a close at the end of the month, the county reported between $3 million to $4 million in additional revenue, Vera said. The reason is that the commissioners approved a budget with deep cuts last year over Vera’s objections. A lot of the revenue came from the county’s detention center, which had been generating money by housing prisoners from outside entities, including the federal government. The county was also making money from the construction of renewable energy projects throughout the county. “I knew it was going to be enough money to do exactly what we did,” Vera said.